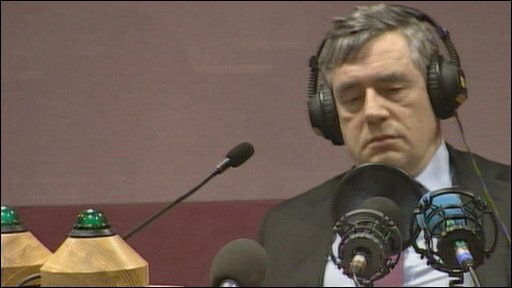 Gordon Brown had wanted to be prime minister for years. 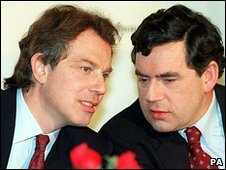 His ambition had burned so brightly that it tarnished his relationship with his rival Tony Blair. He and his team had manoeuvred and plotted and planned for a decade to secure the premiership, seeing off all rivals within Labour so that he was appointed without election. "I will do my utmost," he told us as he walked through the door of No 10 as prime minister for the first time in June 2007. But in the end, his utmost was not enough. Mr Brown has left office less than three years into the job, less time than James Callaghan, the last Labour prime minister to be appointed without winning a general election. Few know when Mr Brown first set his heart on the job. But from the moment he was elected to parliament in 1983, few can have been ignorant that No 10 was his aim. He rose swiftly through the ranks - promoted to the shadow cabinet by Neil Kinnock, along with his friend Tony Blair. But when Mr Kinnock's replacement John Smith died suddenly in 1994 it was Mr Blair who replaced him as Labour leader. Mr Brown agreed to stand aside but the details of the deal haunted the New Labour project as supporters fought over what had exactly had been agreed. In government, as chancellor, Mr Brown gave the Bank of England independence and enjoyed initially prolonged growth and low inflation. He wielded control over large areas of domestic policy, much to the frustration of Tony Blair's allies. He reshaped the tax and benefits system. 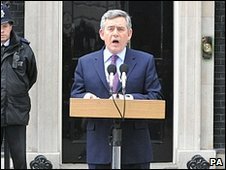 And then after ten years waiting in the wings, Mr Brown was cheered as he left the Treasury for Downing Street in the summer of 2007, promising change and renewed trust in government. Within weeks of becoming prime minister, he faced acts of terrorism, foot and mouth and floods across the country. Encouraged by good poll ratings and optimistic colleagues, he toyed with calling a snap election in the summer of 2007 - but he hesitated and eventually called it off. His opponents accused him of dithering and the polls began to dip. The party he led lost elections - for London mayor, for numerous town halls in England and Wales, and by-elections in Crewe and Glasgow. There were rows over political donations and the loss of public data dealt further blows to his authority. He abolished the 10p tax rate to pay for a cut in the basic rate of tax, a hugely unpopular move he later admitted was a mistake. The Liberal Democrat Treasury spokesman Vince Cable memorably said Mr Brown had been transformed from Stalin to Mr Bean. And then came the financial crisis. On the one hand, his reputation for economic competence was called into question. Northern Rock suffered the first run on a major British bank in recent memory. There were questions about his light touch regulation of the City, the scale of the financial deficit he had allowed to grow. But there were also plaudits at the way he and his Chancellor Alistair Darling handled the crisis, recapitalising the banks, agreeing an economic stimulus package that was copied worldwide. His G20 summit in London was widely praised. In the midst of all this, Mr Brown brought Peter Mandelson in from the cold to beef up his team, a team that was soon minus one spin doctor when Damian McBride resigned for making unfounded personal smears about senior Tories. Then last summer came the rows over expenses. Mr Brown's response was slower than his opponents, his YouTube performance proposing changes failing to resonate. Mr Brown had always had his critics within Labour and in the summer of 2008 he faced his first leadership crisis as some junior ministers and MPs openly called for him to go. Then in the summer of 2009, he suffered a flood of Cabinet resignations - Hazel Blears, Jacqui Smith and even James Purnell who went on the day of the European elections when Labour came third with just 16% of the vote. He survived them all, as he did in January of this year when two former Cabinet ministers - Patricia Hewitt and Geoff Hoon - called for a leadership contest to resolve his position once and for all. And then on the campaign trail, he met a woman called Gillian Duffy, a pensioner from Rochdale. His private remark that she was a bigoted woman was caught on a microphone and played to him as he gave an interview, the blood draining from his face as he held his head in his hands. Mr Brown visited her at home to apologise but the damage was done. Mr Brown entered this election arguing that his substance and experience would defeat calls for change. In the end, it was not enough. The clunking fist ran out of punch.